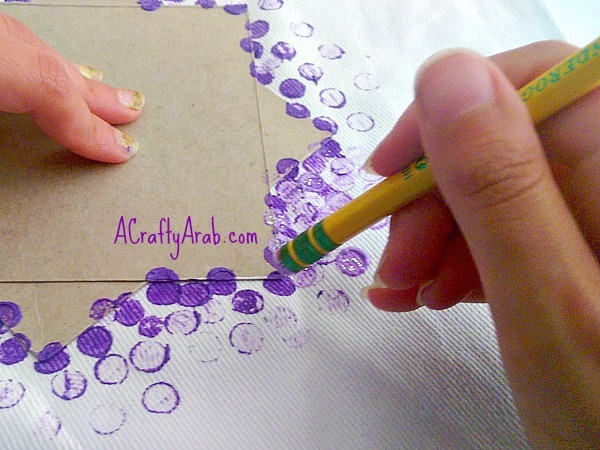 We love dot crafts because they are easy and don’t require a lot of talent. 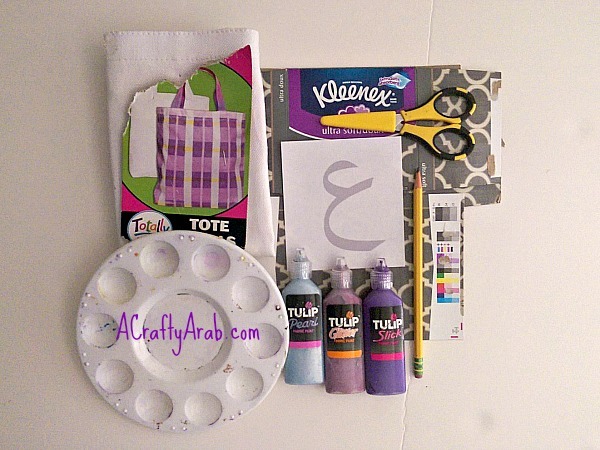 We made this Arabic Initial Tote using a used Kleenex box as one of the supplies! 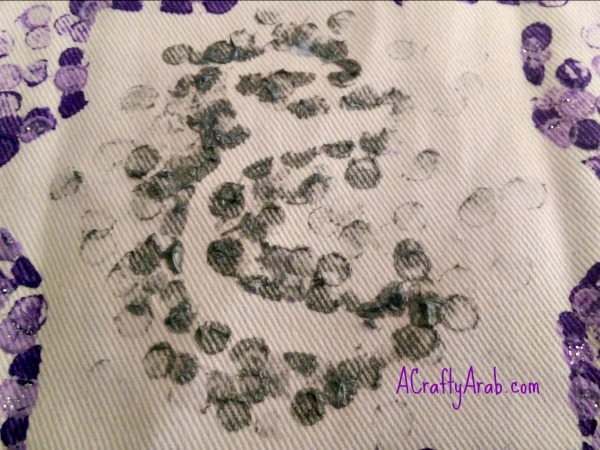 We’ve made Arabic Letter Window Ornaments in the past and thought we’d try the same technique on fabric. Sometimes it’s hard for kids to learn to draw and try to be “perfect” but when you give them alternative ways to paint, it becomes less about how they draw, and more about the overall design. 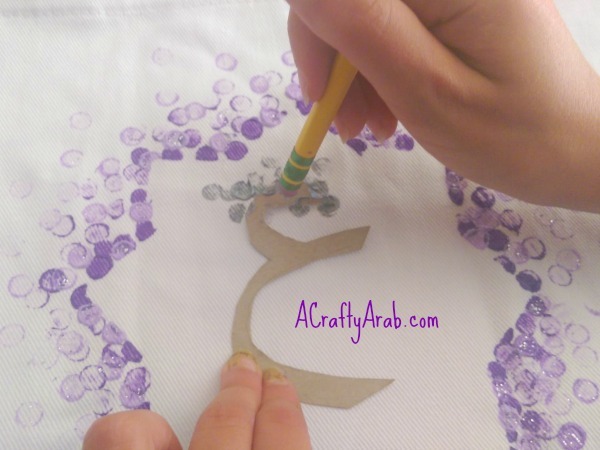 Today as part of our 30 Day Ramadan Crafts Challenge, my middle daughter created this personalized tote with the Arabic letter Ayn on it. 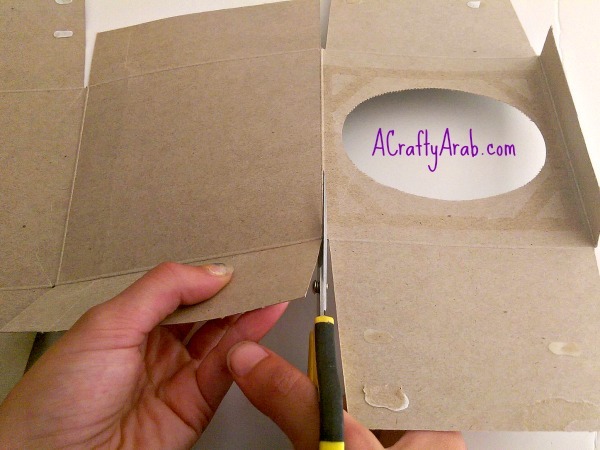 Cut out your Arabic letter. Cut your tissue box on the lines and save the three largest squares. Measure out your two biggest squares and make sure they are even. If they are not, cut off the excess so that your have perfect squares. 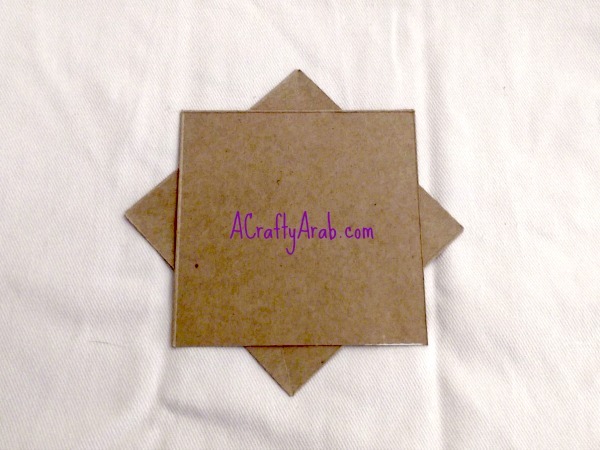 Trace and cut out the Arabic letter Ayn from the third tissue box cardboard square. 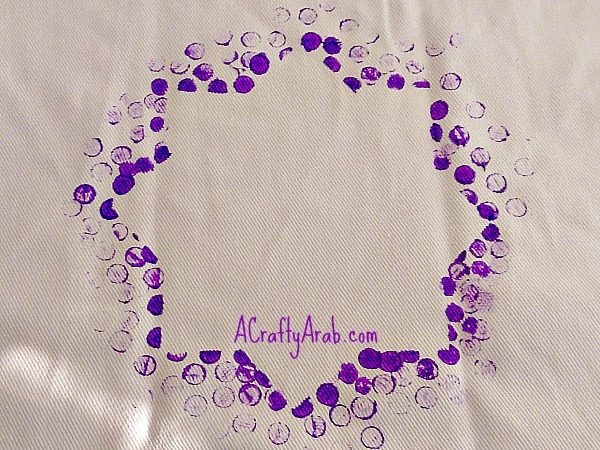 Place your two even squares over each other to create your Khatam star and put them on your tote. 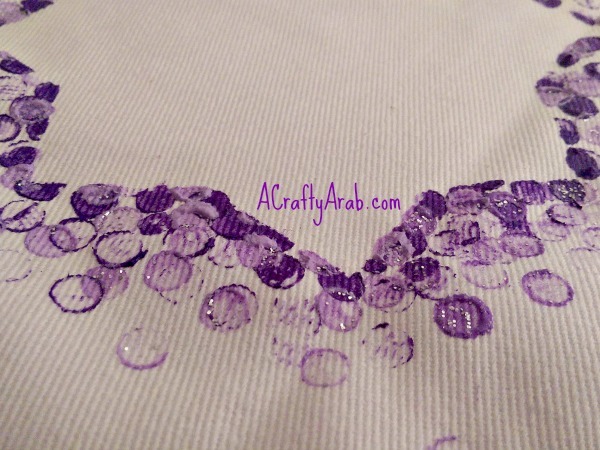 Place some fabric paint on your palette and use your eraser to try out a few dots. 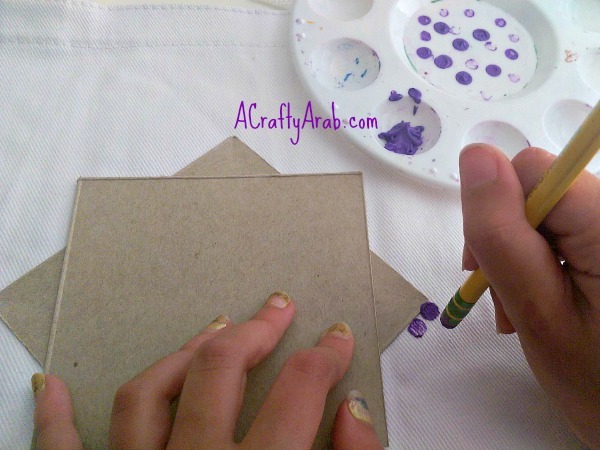 Then while holding the cardboard with one hand (you can also put a piece of double sided tape for younger kids) start using the eraser to place dots of fabric paint around the Khatam star. Carefully lift up your cardboard and see if you’ve got all the points painted. Lay the cardboard back down and do a second color if you’d like. Our second color was a lighter purple but with bits of glitter. You can see some of the shine in this photo. Let your star outline dry. Take your letter cardboard cut out and place it in the center of your star. Outline the Ayn with a different color. Ours was a silver glitter with hints of blue. When you are done making dots, gently lift up your letter and make sure you like it. 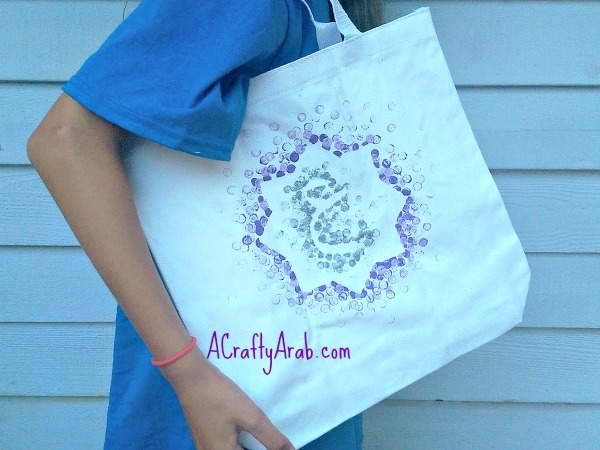 Your tote is ready for madressa (Arabic for school) in the fall! Or as an Eid present that my daughter is planning on giving a friend. 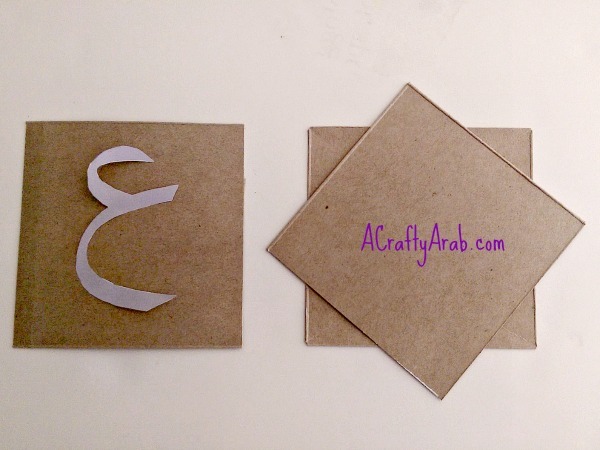 Be sure to visit A Crafty Arab on Pinterest to see more DIY crafts that celebrate the Arabic language.